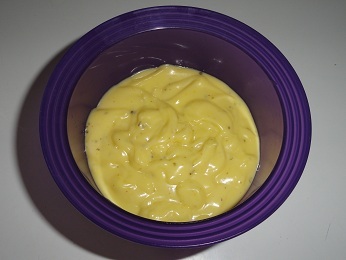 The first recipe I will be posting is for paleo mayo. While by itself it is not very useful, it is a necessary ingredient for two of my favorite recipes, paleo crab cakes and paleo crab dip. You can look forward to those recipes in the coming weeks. Add both egg yolks, the mustard and 1 tsp of lemon juice. If you have one mix these ingredients with a food processor while you slowly pour the cup of extra light olive oil into the mixture. I have had success just mixing the egg yolks with a fork in a bowl quickly. Add the rest of the lemon juice. how long does this mayonnaise last in the fridge wayne? For me it lasts 3 weeks without it going bad. I don’t trust it after 3 weeks but it might still be good.